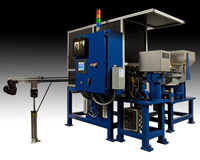 This Automated System was designed to assemble and inspect 2 valve spring seat assemblies per cycle. Seats were fed at 30ppm to a two-part escapement for loading into nests on the four-station dial table. The first vision system verified correct spring orientation at the bowl discharge then allowed good parts to advance to a pick-place that sat the valve springs on top of seats. A high force press cylinder completed the assembly of the two parts. Assemblies were unloaded with a servo pick-place that also raised parts into a dead load tester prior to final vision check and packing. The second Keyence two-camera vision system was programmed to verify parts were assembled correctly and to double check spring orientation. Good parts were advanced down the accumulation conveyor while bad parts were pushed off line to a customer reject bin. Machine status and functions were displayed on an 8" color touch screen HMI. An AB micrologix PLC controlled all machine operations.